The inaugural season of the AUDL came to a close on August 11th, as the Philadelphia Spinners took on the Indianapolis Alleycats in the league’s first championship game. The AUDL experienced a series of ups and downs throughout its inaugural season – from a record-setting attendance at the Spinners home-opener, to legal suits currently pending in both the Eastern and Western divisions – but it was capped off with a great finals game that brought the AUDL championship trophy to Philly with a 29-22 victory over Indianapolis. The game was held at the Pontiac Silverdome, home of the Detroit Mechanix. The massive venue was expected to draw thousands of fans, as reported by Ultiworld, but only drew close to 300 fans. While the Spinners started the game on offense, it was their defense that set the tone. Several early breaks gave them a comfortable cushion to work from, and they’re defense would be able to rattle off more breaks as the game continued. While the Alleycats had some break opportunities of their own, they would live and die by their huck-heavy offense. The Spinners defense was able to respond, and execute on offense, by methodically working the disc up the field, as they had done all season long. Alleycats captain Jonathon “Goose” Helton told me that going into the game, their defense was planning on disrupting the rhythm of the Spinners offense by forcing them to go deep. That plan was not executed come game time, as the closest Indy would ever get was within three, towards the end of the second half. When the AUDL was first announced, the Alleycats’ signing of Brodie Smith was thought by many to set Indianapolis up to take home the championship trophy at the end of the season. An early season knee injury left Smith out for most of the playoffs, and limited in the championship game. The Alleycats had hoped to have a healthy Smith and fellow University of Florida alumnus Chris Gibson for the playoffs and championship game, but Gibson was unable to make the trip and Brodie was not 100% come game time. Smith was limited to an offensive role in the game, and it quickly became clear he was on the field to huck the disc. It will be left up to question whether or not the game would’ve ended differently had Smith been fully healthy. 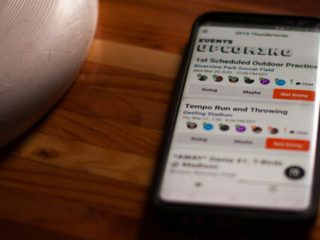 The Spinners are comprised of a large Southpaw base, and now after winning the inaugural AUDL championship, Southpaw will face the “double peak” challenge to have success in the USAU Club Season. 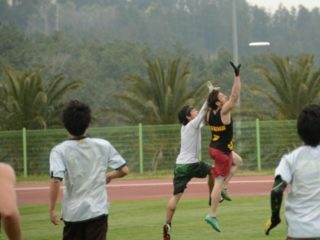 Captain Trey Katzenbach said that it’s going to be difficult but that no matter how the transition goes he wouldn’t change a thing after seeing how playing in the AUDL has advanced the sport. At the game, the AUDL debuted the championsihp trophy, and league mascot, “Disco”. After the game finished, commissioner Josh Moore thanked the teams and fans for a successful first season and wished the league well for next season. Helton tells me that he thinks the AUDL still needs to refine its rules and officiating, as the league “needs to adapt to succeed.” Next season is already shaping up to be more exciting, with the league adding more teams throughout the Northeast. Some of the new locations will feature a strong base of experienced USAU club players, and the prospect looms for more Club teams to take on the same challenge as this year’s Southpaw-Spinners. 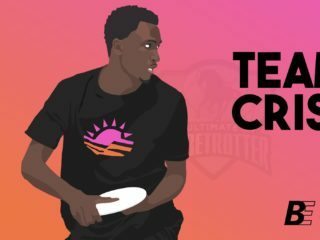 Either way, with the first AUDL season in the books, more great Ultimate is on the horizon for players in both both leagues.